Removed the .git folder accidentally left in the release file. 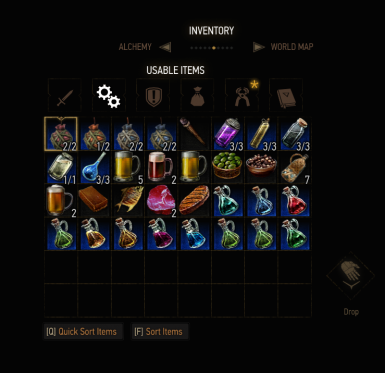 Tired of opening your inventory to apply your oils at the start of combat? Then this mod is for you! When either of those things happen the mod scans the enemies around you, and applies the oil that will be effective most against them. Use NMM to install the file. Download the file manually and extract the contents of the folder to your Witcher 3/Mods folder. If you use a lot of mods try using the Script Merger tool to resolve any conflicts that might occur. If notice any situations where this mod is not running as intended, please post a description of your problem in the comments. If you could post your mod list alongside this it will help me get to the bottom of the problem much quicker. If there are any active bugs I will post them in the Bug Reports tab so please check that first to see if your issue has already been reported. If you feel you've got more information about the bug or you just want to remind me that it needs fixing please comment! CDPR for the game and mod tools! AnotherSymbiote for creating the Script Merger tool. Tenzian for maintaining this mod.